A crate has arrived containing 45 artist's books by 25 artists for one part of an exhibition that is going open on 6th May at Doverodde book art centre, in Denmark. 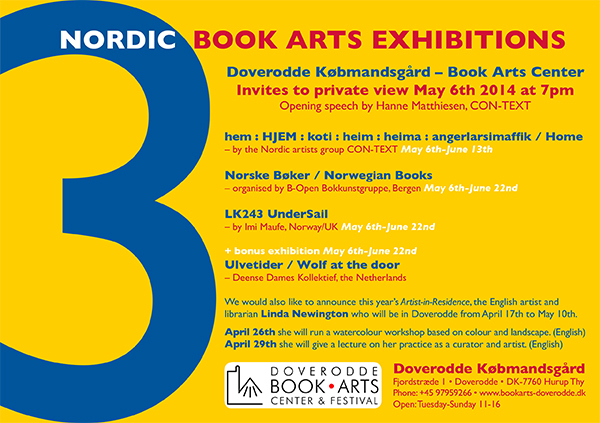 The books form an exhibition called Norske bøker, that will travel to various locations over the next year. Next stop is hopefully Bergen library, with the final stop being at the University of the West of England, Bristol in feb 2014. LK243 UnderSail will also be at Doverodde before it travels to Norfolk for Cley14 opening on 3rd July.